Time and temperature changes: Previously, I used the baking instructions from America’s Test Kitchen, which at the time were to heat the oven to 500°F, lower it to 425 after the pie was in, and then, 30 minutes later, reduce it to 375 for the remaining baking time, for about 60 minutes baking time total, which was also rarely enough. I bet you can guess what would actually happen every time I made this: I’d remember to reduce the temperature the first time, never the second, and it also looked overbaked before it was done. Stella Parks recommends baking the pie at a single temperature (400) for a longer period of time (75 minutes), and even gives you a suggested internal temperature if you’re nervous about doneness, and lo, it was perfect, with a crisp bottom crust (despite having no parbaking step) and with caramel-y juices. I haven’t looked back since. I use more apples and I cut them thinner: One of the most frustrating things that happens when you make a pie is that you put in what seems like a massive amount of fresh fruit but after it slumps, shrinks, and nestles in as it bakes, you’re left with a very flat, if not concave, pie. Parks has a fantastic tip of having you mix your filling and let it macerate for a while so that the apples soften, allowing you to put a lot more in the filling and leading to pie slices stacked to the brim with apples. 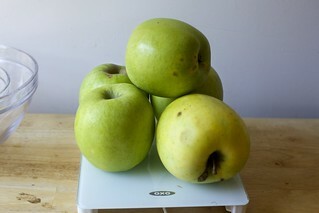 My original recipe calls for 3.5 pounds of apples; I’m now using between 4.25 and 4.5 pounds. Better to have too much filling (and bake it separately in a dish for the oatmeal or yogurt topping of champions in the coming days) than too little. I also cut the apples more thinly, a scant .25″ thick, which also allows them to nestle in more tightly so they don’t fall as much when baking. Order of operations: Because we’re going to let the apples macerate a bit, I now prepare them first, and the pie dough second. They don’t mind waiting. I like a mix of apples — usually: Most apple pie recipes, including my original one, want you to use hyper-specific amounts of hyper-specific kinds of apples, which is rarely what anyone has. 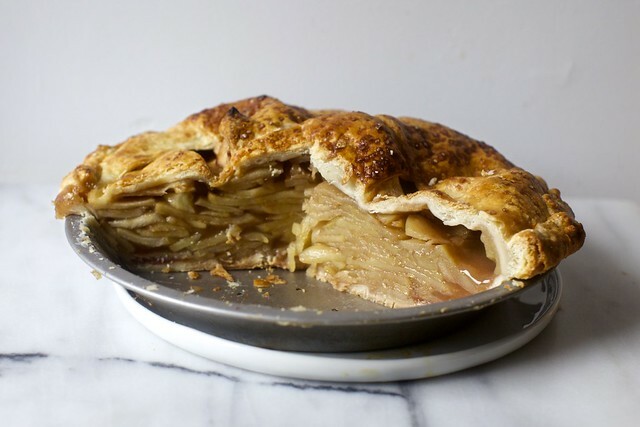 I feel strongly that a mix of apples, ideally ones that won’t fall apart when baking, see this awesome page if you want more guidance as to which ones to choose, is the way to get the most nuanced and dynamic apple flavor in a pie. Nobody wants a one-note pie. That said, the orchard we were in had a ton of massive mutsu apples ready, and I made my last few pies with them only. Turns out they’re fantastic baking apples. “Uh, Deb, you just contradicted yourself.” Yes, and I want you, too, to go with the flow. Flavor changes: Although I started skipping the lemon because we were out of lemons, when I didn’t miss the flavor at all, I never bothered putting it back in. Ditto with the lemon zest, which I found distracting. I also increased the cinnamon and added a little ground ginger (which won’t make it gingery, promise; it just seems to wake the pie up a little). Finally, I started swapping half, then more, of the sugar with brown sugar and I really don’t know why I wasn’t doing this all along. It’s lovely here. Thickener changes: Over the last few years, as tapioca flour/starch (they’re the same thing) became more easily available (Bob’s Red Mill makes some, so check any store that stocks the brand, or here or here or here), I started using it as a pie thickener and never looked back. It’s clear and unchalky once baked, and doesn’t muffle the filling flavor the way I find some commercial thickening blends do. You’d never really know it’s there, which is basically the dream. This is an update to my 2006 apple pie recipe, with a few new tricks from the fantastic Bravetart cookbook. Make filling: Combine sugars, salt, and spices in your absolutely largest bowl. Peel, halve, and core your apples and cut them into thin (scant 1/4-inch) slices, adding them right to the big bowl. Toss to coat the slices as much as possible. Set aside for 1 to 4 hours at room temperature. 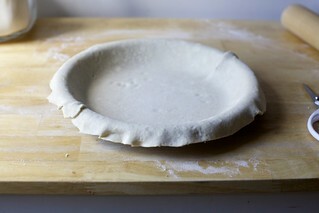 Prepare crust: Make your pie dough according to instructions. If you need to chill it for an hour or two before rolling it out, you can do so now. If yours is already chilled and ready to go, roll out the first half on a well-floured counter [more detailed instructions here] to a 14-inch circle and transfer it to 9-inch standard (not deep-dish) pie plate. With scissors or kitchen shears, trim overhang to one inch all around. Refrigerate dish and dough until needed. For a regular pie lid, roll out the second dough half into the same sized circle, transfer it to a large parchment-lined baking sheet and chill this as well until needed. For a lattice or woven pie lid, you can use the same sized circle, or you can just roll it into a rectangle at least 14″ in one direction, and then as long or wide you can get it in the other. Transfer it to a parchment-lined baking sheet and chill this as well until needed. Assemble pie: Stir tapioca starch into apple pie filling. Pour filling into prepared bottom crust and use your hands to pack and heap those softened apples as mounded as you can get them, then add a few more. Pour any juices that have accumulated carefully over apples; do not leave any behind. 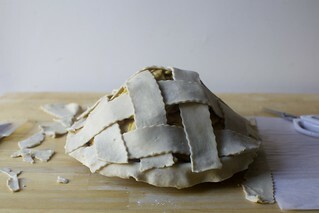 Either place your second pie dough round over the filling or cut it into strips to lattice the top. [Detailed classic lattice instructions here, or try some of Erin McDowell’s gorgeous iterations.] Trim the top crust or lattice strips to the edge of the pie dish. Fold the overhang from the lower crust over to form a thick rim, and crimp it together with your fingers or a fork to seal it. Brush top crust with egg, then sprinkle with sugar if desired. If your top crust is in one piece, cut a few vents in it with a sharp knife. Bake pie: Reuse that sheet of parchment paper on the large baking sheet for easier cleanup, then transfer your prepared pie onto it. Bake for 75 minutes, turning once or twice for even color. If your pie is browning too fast, take a large square of foil, mold it over the back of a large bowl into a convex dome, then use that to cover the pie in the oven for the remaining baking time so it doesn’t brown much further. Pie is done when juices are bubbling visibly through the vents or lattice, or when the internal temperature reads 195°F. 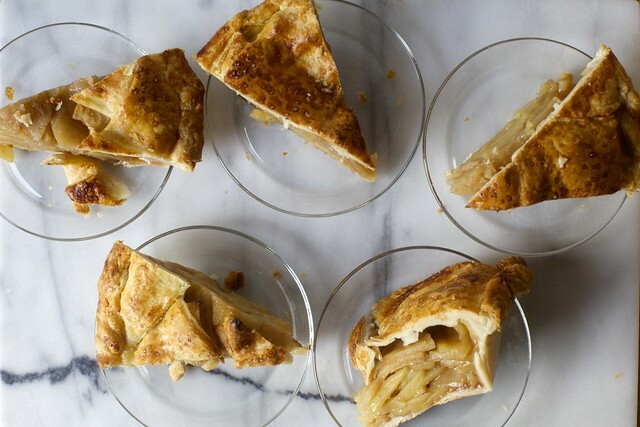 A tester inserted into the pie shouldn’t hit any overtly crunchy apple pieces. To serve: Cool pie for at least one hour at room temperature before cutting into it. However, your filling will not fully thicken until it has fully cooled, ideally in the fridge for a couple hours. You can rewarm slices as you serve them, if desired. Leftovers keep at room temperature for 2 to 3 days, and in the fridge for 1 week. Can’t wait to try it! Happy Apple Month!! This looks insanely amazing, Deb. My husband thanks you in advance, no doubt. You might give a thought to anise. Some apples have it as a flavor component, so if you like it.. you might want to emphasize it a bit. One year I had a bushel of grimes apples.. made one pie after another and they all disappeared. Ran out of Grimes and used golden delicious.. that pie hung around for ever. Went to Jonagold.. disappeared again. The apple makes a difference. “You can rewarm slices as you serve them, if desired.” How do you recommend reheating the pie? Microwave? For how long? Oven or microwave. I don’t really fully reheat mine, so I’m not sure, usually just microwave for 10 to 15 seconds to get the chill off. Oven would be better for keeping the crisp crust intact. All those layers of apples are making me rethink everything I’ve ever thought about apple pie… I may just have to skip dinner to bake this instead! Looks amazing! Do you think this would generally work as a slab pie? I’d 1.5 the crust and keep the filling the same? I’ll save you the trouble — Apple Slab Pie in the archives, feel free to make some of the flavor swaps here, as well as to use tapioca starch/flour. I’ve become a big fan of brown sugar. Not surprised to hear it hits the right note here. Hey Deb, I have the same Cuisinart food processor as you do. Do you think the slicing blade would cut the apples too thin? Not sure because I almost never use it because I find the pieces that come out to be unsatisfyingly irregular. I do agree it could be too thin, though. I have one of those devices for apples that peels! Cores! And slices! All at the same time. I’m thinking this would be a great place to use this as well as a huge time saver. Francoise, I used an apple peeler like yours and it was perfect! I cut each apple in half after it came off the peeler. Hahahahahah “leftovers”? I assume you that these numbers are purely theoretical, since I haven’t met an apple pie that survived past tomorrow’s breakfast. This is 10000% my kind of apple pie: almost entirely apples with a little crust to approximate a pie shape (because, real talk; I could easily polish off 4 lbs of baked apples in a dish, but wedges = portion control). Love that you ditched the lemon and have become a tapioca evangelist; once I discovered it, I forsook cornstarch or flour forever. Thanks also for the straightforward crust recipe. Over the years, I think I damaged an optic nerve from the eyeroll-inducing fussiness of some, er…”national experiment scullery” (wink, wink) orthodoxy — Ukrainian vodka at precisely 6 degree Celsius! water with exactly two ice cubes! butter in .27” dice! — and your simple method has never failed me. Out of curiousity, have you tried this with a splash of Calvados in the filling? Just wondering if that might be a nice enhancement…or if could be gilding the lily? I’ve been thinking about bourbon. I once had a piece of bourbon brown sugar apple pie at a bakery and I’ve never forgotten how good it was. I wouldn’t think that a small amount would make any difference in taste, but with a larger amount you probably have to cook it with a filling first. So I suppose that’s a separate project than this pie. I’ve used apple brandy sometimes, and buttershots (butterscotch schnapps) other times. Soooo good! Oh, and won an award! In the paragraph about the mix of apples, I think you mean Mutsu apples? I don’t think there is any such thing as a mistu apple :-) The recipe looks amazing and I will try it soon – I have a fridge full of random apples given by neighbors, no idea what they are which means they’ll probably make a great pie! I like the look of the lattice pie, but if I do it, I will cover the sheet pan with foil before baking…it looks like you have a real scrubbing job to do…even if you soak the pan first. ugh. Nonetheless, thanks for the timely update! I’m so excited to turn my bounty of apples into this gorgeous pie! My go-to apple pie recipe is Joy the Bakers, in which she macerates the apples with the spices and sugars and then drains off the liquid and reduces it into a thick, concentrated apple pie caramel that you toss with the apples as you assemble the pie. It reminds me of your apple cider caramels from your first book in that decadently concentrated apple flavour that I often find lacking from apple pies. I also started cooking the apple liquid to thicken, then pouring back over the apple slices, then loading the filling into the pie. It really makes the apple filling delicious, but it is an extra step…..
insisted on eating hot apple pie, even if the baker says “not yet”? Mutsu apples are THE BEST!!! Does the tapioca starch make it…stretchy? I only ask bc my MIL uses tapioca starch to thicken her gravy. And boy, does that gravy strettchhhhhh when she pulls the whisk from the pot. I personally can’t deal with it. Wow, that looks amazing. I often find that pies don’t have enough fruit in them and you find a gap between filling and lid, but that’s not an accusation I could level at this wondrous pie. I’ll have to make it for my husband, apple pie is his fave dessert. How do the juices not overflow the pie until it glues the pie plate to the sheet pan? Them’s a LOT of apples..even if it has plenty of thickener! I keep waiting to bake a fruit pie that doesn’t ooze all over the crust edges and glue the crust to the pie plate, also. Tell us the secret, Please? If the pie crust is unbroken at the bottom and the edges are covered with crimping, it shouldn’t happen, but sometimes it does. I made this three times. Two didn’t stick, the last one is stuck in places, but comes out cleanly once the first slice is out and you can loosen the pie with a thin spatula. TOTALLY overflowed for me, and smoked up the entire house. :( The pie crust was unbroken, and the edges were crimped. I have seen apple pie recipes where the apples are cooked in advance, which keeps them from shrinking as the pie is baked. Have you tried this? Would it work for this recipe? I don’t find it necessary with this technique. When you macerate the apples, they soften and release some of their liquid. (Although most of the liquid you see is dissolved sugar; sugar dissolves when dampened.) I find that there’s a real risk to having mushy, overcooked apples in a pie if the pie filling is precooked. I always microwave the apples first to get them a little soft before I put them in the pan; that way the crust doesn’t get overbaked. I use 9-10 medium to large apples, sliced thin, and nuked for 7 minutes (stirring midway). Bake at 375 for 45 mins and it’s perfect. This week, I tried adapting your apple cider caramels recipe into an apple cider caramel sauce and it works perfectly (you just stop cooking it before it reaches candying temperature and let it boil enough to dissolve the sugar). 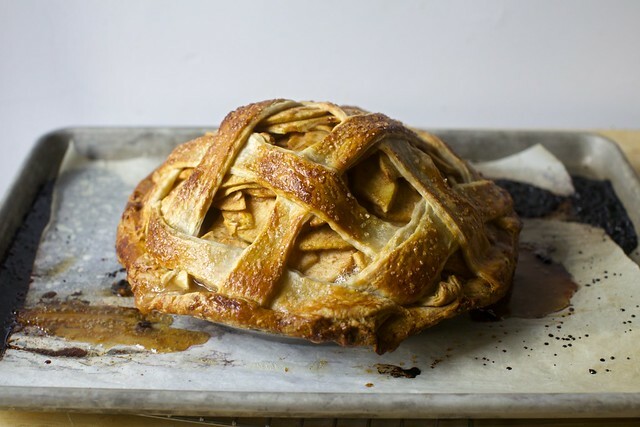 I bet it would be insane as a drizzle over this amazing apple pie. It would be over-the-top apple insanity. I realize that it would depend on the size of the baking dish, but any thoughts on how to convert these measurements to make it a slab pie? I’m thinking of Thanksgiving. Already on it! You can use the flavorings and other tips here, however, and probably fit more apples in it. I prefer a less full/overstuffed pie. Do you think the baking time will change if I 3/4 the apples? It might bake a little faster, but not a lot. I would not use 3/4, but maybe just 3 1/2 pounds. At what level (bottom, middle, top) do you bake the pie? I think some people recommend the bottom but I use the middle. However, my oven is garbage and I don’t think that what works in other ovens necessarily applies for me at home. MMmmmm…love the idea of extra quantity of thinner slices of apples. And being Canadian, I have begun to swap out the brown sugar I have used all along for real maple syrup. Delish! Yum! I’m addicted to your pecan slab pie from the last book! But Deb, Stella says to macerate for 3 hours and then to chill the crust after shaping for 2… Should that be done or does it not matter? I’m not following her recipe exactly; I just applied a few of the tricks here. I found even an hour of macerating was beneficial, and I went longer when I had time. She has you chill the crust after rolling it because she doesn’t have you chill it before — her pie dough is rolled out right away. She does recommend chilling the assembled pie before baking it but I don’t do this and haven’t been unhappy with the results. I don’t see why you couldn’t make a shortening crust instead. Just use it for the butter, or search online, many people prefer it. My mom used the Mazola recipe (https://www.mazola.com/recipe/Oil_Pastry_-Pie_Crust-). She was a champion pie baker and her dad a champion pie eater. When he had a heart attack, Mom took up this recipe. I grew up on it, and though I don’t use it now, I have family who swear by it. Mom would only ever use Mazola. I have no idea whether science would say that mattered, but it did to her, so for all intents and purposes, it mattered. King Arthur Flour carries a boiled apple cider that they use in their apple pie recipe, and it’s an excellent addition (reduce the sugar a bit) to make something even more apple-y tasting. We have LOTS of apples from apple-picking last week (made 11 quarts of applesauce already, but that only used maybe 1/3 of our apples), so it may be time to make some pie this week. The pictures look like potentially two different pies with two very different heights at the end – true? Wondering if one had a tighter lattice on the top (as it looks like maybe the less towering one did), did you wind up with a gap between the crust and apples, or did it collapse down with the fruit? You’ve inspired me to make apple pie for a dinner party tomorrow night and I’m strategizing about the lid… it seems like the looser lattice would be a challenge to slice neatly. I made this pie three times and the photos are a mix of them. No two will ever look the exact same, but there was no gap in any (I think there’s just a little hole where apples slipped in one), and the recipe was the same each time, to the letter. We made this pie tonight with a full crust top and ended up with a large gap between the apples and crust, unsure why. Followed the recipe as written. I had the big gap too, but it honestly never bothers me, it’s delicious all the same! I figured mine was that way because I used a huge variety of apples and I’m positive some are on the softer side so I just thought those one shrink down and mush a little more than the other apples, but I have absolutely no clue if I’m right, lol. Either way we LOVE how it came out, gap and all! I had a big gap too. I had a large heap of apples and the crust was sitting right on top of them before I put the pie in the oven. I did not use a lattice crust (b/c i’m lazy). It seems to me the crust is baking into its shape and then apples are shrinking as they bake and I’m left with the big gap. Is it the high oven temp? I’m retrying again today but letting the apples sit for a bit before I assemble the pie. This is always the problem I have with apple pie. It’s my dad’s favorite and Mom always makes him a one crust pie – so I like to bake him a two crust – but I always always end up with that gap. Haven’t tried this recipe yet but that’s my worry. When I made it, I really packed in the apple slices as much as possible in the pie plate, and I wound up with virtually no gap between the fruit and the lattice – not sure if all the compression was directly responsible for fruit not sinking or not, but I’m definitely going to stick with that strategy in the future! The apples in this pie were spectacular. I am definitely hanging on to that method. Unfortunately, I had a significant dome on my first try with Deb’s crust. I’ve had it before, too, with other crust recipes. After Sunday’s experience, knowing that Deb always tests and won’t steer us wrong, I got frustrated with myself. I figured my methods were off somehow, so I started digging for answers. * alter the amount of water or use a different crust recipe. From Deb’s recipe, I used the full 3/4 cup water which brought the butter-to-water ratio much closer to even than what KA recommends. With regards to lemon zest being distracting: it seems like that’s true if basically every recipe that isn’t lemon bars. BUT orange zest is way better at playing second fiddle to other fruits or even plain sugary desserts. I even added some to your mega sour cream chocolate chip coffee cake. It didn’t taste orangey, just awesome! I love Mutsus for apple pie! 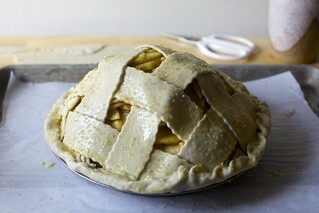 I’m totally making this pie this weekend–cold and rainy in Chicago so perfect baking weather! Sounds amazing! I would love to make it for our Sunday birthday brunch, but wonder if there are some parts I can do beforehand (Saturday night)? I would be so so grateful for advice! I would just make it whenever you can — it keeps for days. You can gently rewarm it in a low oven. Any thoughts about freezing this ahead of time? It sounds great for Thanksgiving dinner. I like to be able to freeze several days ahead as I have a lot of guests and some sleep over several nights so the kitchen can get rather hectic. Thanks so much for sharing! Any ideas, re: gluten-free crust? Thank you! I have one in the oven now using Bravetart’s gluten free crust recipe from the Serious Eats website. I’ll let you know how it turns out! I bought the gluten free cup to cup pie crust mix but haven’t used yet. Anyone ever use it? I’m hoping it’s good! Your notes all makes so much sense, thank you for this article! My mother used to make apple strudel in a similar way. The other thing she used to do is when the apples finished macerating, she drained the juice and reduced it until it was a syrup. She would then baste the crust during the baking time with this reduced syrup, it gave such a lovely crispy top. The question I have for you has to do with tapioca starch, I find it gets a mucousy texture, and can’t bear it in baked goods for that reason…do you have a suggested alternative? I am ok with cornstarch, or just some flour. Thank You!!! I’d consult this thickener chart from King Arthur for an alternative; they list them all! Just piping in here, an alternative would be ground dried apples.. Ms. Parks uses them later on in BraveTart, in her McDonald’s-inspired apple hand pies and, from experience, they really deliver on the promise of a deeper apple flavor without compromising the structure of the pie. Try coriander as the spice — alone or with just a pince of cinnamon. Maskes a deliciously bright pie. Thanks for the tip about how to get enough apples in to keep the pie from falling in. Quick question: Could you share the details on the mandoline you are using in the photo? It looks like one of the more basic handheld types. I totally agree that Stella Parks is a baking wizard; she comes up with the most amazing ideas and techniques! I’ll definitely be making this pie. I have and love this one, although if I were buying it again I’d probably get this wider one that they make now. Hi Deb – I notice you didn’t pre-bake the crust, just want to make sure that’s not necessary? I’ve skipped it in the past and ended up with soggy uncooked bottom crust. I didn’t. I didn’t find it necessary. I found with a long enough baking time at 400, it gets crisp. None of my three pies had soggy bases once fully cool. Discovered Mutsu’s before they were fairly readily available, back in the 1970’s ! ( A sister was a plant science major-she even gifted me a Mutsu Tree once, it was pretty happy in my yard, but I moved from that house.) Best. Apple. Ever. Love, love, love them for everything. So glad you gave them a mention- they are well worth seeking out for those who haven’t tried them.I can imagine the taste of this pie just looking at it. Looks like my favorite Apple Sharlotka’s less-dressed-up twin. The Sharlotka is one of my Smitten all time great faves! Curious whether freshly grated ginger would work in lieu of ground ginger? I feel like the flavor profile is different, but if you don’t mind the brightness, go for it. On a microplane would be nice. Stella Parks is a GENIUS. Her biscuits alone are OFF THE HOOK. My husband and I belong to an organic apple CSA. We get 20 pounds of apples every other week. Jeannie, who owns the orchard has many heritage apples and some newer kinds, all so good, but so many. I am making your newer pie tonight, with a mixture of her apples. I think I may add a pinch of cardamom instead of cloves. I am also going to dry more slices as well this weekend. She gives the history of each kind and how best to use it: raw, baked, dried, or cider. I am going to send your post to her as I am sure she will like it. Actual tapioca granules instead of tapioca flour OK? Same amount? I used them in peach-pie squares recently, substituting them for the same amount of flour in the recipe (2 tablespoons). Are you weighing the apples before or after you peel and core them? Before! I would definitely tell you otherwise. Up before dawn sorting my apples, and just gathering my thoughts before diving in. I cannot wait to sample your tweaks. Starting big and making 4 pies (+ 3 tiny ones). Grabbed a couple bags of Bob’s Red Mill tapioca starch on clearance, so I’m set! Had dinner guests last night so I made this pie. Let me start by saying the flavor of the spiced apples was heaven! Just perfect. Like an over stuffed suitcase, I squashed the apples down until they cooperated. I did my best to make a lattice top. My pie did not look like the one in the photo. I topped the too-brown crust with foil but my crust was overcooked. I took the pie out about 5 mins. sooner than 75 mins. and my apples were softened but not as tender as I would like. The lattice top remained while the apples compressed leaving a weird open tent. Next time I’ll stick with the filling recipe with fewer apples and a different crust. I had the exact same issues. Top crust was overcooked, despite covering with foil, and the apples collapsed, leaving a gap of more than an inch between the filling and the top crust. About half of the apples in the filling were still on the crunchy side. Pie fail. The liquid never thickened up. I should have stayed with Grandma’s recipe and precooked the filling. I’ve used the Cook’s Illustrated recipe where you cook the apples before assembling. Is this step necessary? Between kids and time and whining , it’s too many steps. Your apple pie is my go-to! I’ve made it almost a dozen times, fitting for the 12 years it’s been up. Except that I always spiced a bit more heavily and never have lemon zest. Can’t wait to try the new recipe with the Stella-tweaks, maybe for my sky-high apple pie-loving friend who invited us over for dinner tonight. Hi Deb! Long time reader—all my friends know and love “Deb recipes”! If I’m prepping ahead, could the apple mixture stay in the fridge overnight? I’d love to prep crust and filling the night before, then roll out, assemble, and bake the next morning if the apples would hold up well. Would refrigerating separately be better than keeping the whole unbaked pie in the fridge overnight? Does anyone have a rough estimate of the number of cups of apples once prepped? Or the number of medium sized apples? I know it will vary quite a bit but I don’t have a scale so any estimate would be super helpful!! My mixing bowl was filled to the 3qt mark, if that’s any help! I need to break this into steps, and will be baking it tomorrow. I know it’s not a problem for the pie crust to be made the day before baking, but what do you think about letting the apples macerate in the fridge overnight? Too long? Just tried the recipe, and it was a smash! I only had 3.5 lbs of apples, but the suggestion to slice them very thinly (ie, on a mandolin), then letting them sit to macerate for a few hours really made the difference! They were soft, yet not mushy at all! I packed a streusel topping on top instead of a second crust, and that was the crowning touch. I’m from an apple-growing region (Quebec), and have made my fair share of pies, but this was bakery-worthy. Thanks, Deb! I made this today and while I did have a space between the lattice and fruit, the filling was great and the top crust was flaky and delicious. My problem was the bottom crust – it came out soggy even though I baked the pie for almost 85 minutes (at 75 there was still some give in the apples). Any suggestions for ways to avoid this next time? Blind bake the bottom crust until it’s lightly browned, then fill it with apples and put the raw top crust on and bake the full 75 minutes. When blind baking the bottom crust, you don’t have to bother with weights and foil/parchment if the dough for your bottom crust is rolled big enough to hang over the sides of the pan. The edges will overbake but will be very easy to trim off flush with the edge of the pan after the blind baking, and that way you can see how done it is without having to move the foil/parchment/weights to the side. It’s a drag and seems silly to add an extra step, but while you’re bothering to make pie, it may as well be as good as it can be. Soggy crust is a horrible waste of all that work that goes into it. I thought about blind baking or par-baking but I just really wanted to believe it could be done without that step. PS – I love your tip about leaving the edges out so you can tell how done it is! I usually put a sheet pan lined with parchment into the oven while it’s preheating. Then put the pie in a glass pie dish on that pan – that extra heat has made all the difference in the bottom crust for me. I agree with this. The heated sheet pan directly against the bottom of the pie dish really helps the bottom crust be less affected by the moisture in the apples. I use foil to line the pan so it conducts the heat from the sheet pan, too. I used it once for peach pie and it was great. You just have to accept your pie might not be the most beautiful! I cooked this one yesterday and mine came out perfect. I must admit I did not use all the liquid that came out of the apples after maceration. Maybe next time try with less liquid? Yes, even as I poured the extra liquid over the apples I thought it might lead to sogginess but I was determined to follow the recipe the first time and then make changes the second time :) Good to know you held out on some of the liquid and had success – thank you!! I’ve tried both blind baking & preheated sheetpan method for getting a less soggy bottom crust. The heated sheetpan method gets you a much better crust. No extra step — just put the sheetpan in the oven as you preheat for the pie & then put the pie right on it to bake (I don’t bother with parchment). Works beautifully. Other method is too difficult to meld a top unbaked crust to a bottom blind baked crust & in my hands was a disaster. How was it when it cooled? I found all three times I made this, the crust *seemed* soft while the juices were runny but once it had be chilled in the fridge, it was totally crisp. Also, what material was your pie dish? Made this last night and it was excellent! Baked the pie for 75 mins exactly at 400. Covered the pie after 45 minutes, and rotated it then. The pie could have used being rotated sooner, and being covered after 40min as it was just a tad bit browner for my taste. My internal temperature after 75mins was climbing well above 195 degrees. The crust was beautifully bronzed and the apples perfectly tender with some bite. I did a full double crust from Deb’s recipe with a few slits, and it was wonderfully flaky. Thank you, Deb! Helping this nervous pie maker gain some confidence. Would make again. Brilliant! I’ve been making apple pie for years and always had a mess with juices bubbling over, making release out of the pan difficult. I followed the filling recipe exactly, letting sit for a couple of hours. I made mini-apple pies because I have cute tart pans. I found the apples were more tender going in to the oven, because they had released their juices (which I spooned some on top before second crust), by bottom crust was not soggy, the pies released from the tart pans easily, they tasted great and were so cute. I am never disappointed when I try a SK recipe. Thanks Deb! The links have been there almost since the beginning, and “The other side of the world” for at least 5-6 years. There are many SK readers (hi Australia! hi New Zealand!) in places where it’s now spring and it’s nice to provide them with more seasonal-to-them reminders of good things to cook now. So, it’s just 6 month behind/ahead reminders. Deb, if you are looking for things to do with your remaining apples… have you ever made Apple Butter? Made this yesterday, the excessive apples & omission of lemon juice was everything I never knew I wanted. I do still use an ATK pie crust recipe because I know what it’s going to do for me every time, but I think the fact that the last slice is being fought over in our house is reason to print/bookmark/laminate this recipe for life. Just curious…which ATK pie dough recipe do you use? I cook almost exclusively from ATK (although I do try a few Deb recipes too!) and I wondered if you were talking about the one with vodka or what. I have so much trouble with even their recipes when I make a single crust pie with shrinkage. I even tried Milk Street’s and it was no better. sigh. I don’t have trouble with double crust, but I do with single. Is King Arthur’s better? We use the “Foolproof Pie Dough” that has shortening + unsalted butter + vodka! I think it makes a really great, flaky crust!! Yes, this is the one I have used many a time, but when doing a single pie crust, it shrinks. It is great for a double, though. I wish I could find a good single crust recipe. I have been looking for years. I despise pie weights, so that may be part of the problem. But if they don’t shrink, they slump. sigh. When I study into this carefully, I wonder if it is not my method more than my recipe? I see in Cook’s Country (Cook’s Illustrated sister magazine) that there are directions when blind baking to dock (poke holes in) the single crust all over, refrigerate it and then freeze it. Then apparently you can partially bake it and it will hold its shape. I want to try this and see if it works. Sans pie weights! Fingers crossed! This was serendipitous timing – my father-in-law requested an apple pie for his birthday dinner tonight. I made this recipe (but used King Arthur Flour’s double pie crust recipe – my never-fail recipe) using Mutsu and Stayman apples from a nearby orchard. There was only 1 piece left, and I sadly left it for the birthday boy. I definitely will be making this again! We made for a dinner party this weekend! The best apple pie I have made or tasted in a long time! I couldn’t count the number of apple pies I’ve made – and I still like to try new methods. 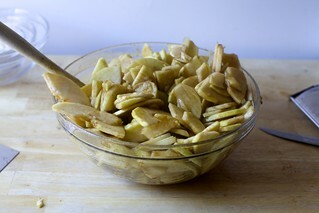 Thinner, macerated apple slices was a new one for me and we loved the results. I followed this recipe (almost) to a ‘T’ and it was gorgeous. With a pastry cutter I added 1/4 cup cold butter (diced) into the sugar and spice mix; I like the buttery caramel flavour that comes out. As a rule I follow Shirley Corriher’s “CookWise” recommendations for mixing pastry ingredients on the counter with the rolling pin, not in a bowl, then scraping it all up and back into the bowl, chilling… repeating these steps a few times to create flat facets of fat instead of round resulting in flakier pastry. Instructions beyond this are too long to add to this comment here but it’s worth researching. Thanks for another great set of instructions, Deb. I recently started adding a smidge of cardamom and black pepper to my apple pie for a “chai” flavor. It’s really divine. I’m going to try that with your suggestions and I bet it’s even better! mmmmm…..
I’ve used instant clear jel for thickening pies but rarely see it mentioned. Is there a downside to this ingredient? Hope not as it makes my pies perfect. Deb, I’m not sure your stance on arrowroot powder as a thickener, but I subbed in 3T of arrowroot for the tapioca starch and it worked perfectly! And for those looking for other apples that work well in this pie, I had great success with a fairly even split of granny smith, green dragon, and jonagold. Thanks for a great recipe! I don’t know what to stare at more—the deep dish-ness of this pie or that FLAKY pie crust! Did you try and it did it work? I made this last night, and it is delicious! Best apple pie I’ve ever made. However, it was a little too sweet, do you think only using the brown sugar and omitting the white sugar would work? Has anyone reduced the sugar amount? I, too, am obsessed with apple pie this fall. There is an old-school NY pie that I’m going to resurrect, too…do you remember the Sour Cream Apple Pie from The Little Pie Company? It’s piled high with apples, and, if memory serves me correctly, nuts, too. It’s got sour cream folded into the fruit and has a generous crumb topping. It was such a treat to get at Thanksgiving, because in the 80’s, that pie was just about $40 (I think)! Anything in Stella’s book is stellar. Period. RE: Your pie pan. I noticed it had little holes in the bottom. Is this to help prevent the dreaded sogginess of non-blind baked crusts? And could you let us know what the name of the pan is, or give a link? Many thanks. I always free my unbaked apple pies for future use. Any suggestions about the baking time and temp for a frozen apple pie? Thank you. I am amazed at your apple piling ability. Do you have a particular technique to get it mounded up so gloriously rather than falling all over and onto your feet? Do you prebake the lower crust? Is that what you mean by a prepared crust? If I wanted to make this in advance and freeze it, when do you think would be the best step in the process to do that? And would you fully defrost it first and then bake the same way or do something different? Thank you, I’m a novice to freezing baked goods and slightly nervous about it! Although my guiding principle for cooking/baking is always: the lazy way wins, I will say that I’ve come around to a technique in Pam Anderson’s The Perfect Recipe for apple pies. She slices the apples then cooks them down in butter, then lets them cool, before putting the filling in the crust. I always say I’m not going to bother because it’s extra work, but then I do because it makes such a beautiful pie. The pre-shrunk apples leave the finished pie shell perfectly full and it *eliminates* (honestly) the need for any thickener. Thought you might be interested since you’re on an apple pie bender :) All that said, imma try your way now. More pie! Made this last weekend for a dinner party with half Granny Smiths and half Cortlands. I sliced the Granny Smiths on the thin setting on my mandolin and the Cortlands on the thicker setting (figuring they were softer and would get really mushy if I did them thin) and macerated for a full four hours. Because I was nervous about all the liquid, I strained it out and simmered it just a few minutes until it was a syrupy texture. I packed the apples into the pie dish as tightly as I could, so they weren’t too heaped up (I also used a 9.5″ pie plate), and poured the reduced liquid over the fruit before doing a lattice top crust. After 75 minutes in the oven, the apples were perfect, there was no gap between the lattice and the fruit, and eight of us polished it off! Fabulous. Did you add the tapioca starch when simmering the liquid? Or did you add to the apples when they went into the pie pan? oh perfect! I have a few Mutsus set aside for a pie that my son requested. I think I’ll do your recipe, but we are very partial to a crumb topping on apple pie so I’ll do that. I made the pie for a large gathering using Cortland and Granny Smiths, nearly 5 lb total. The pie was a super-impressive-looking tower, but it did have a gap under the crust when I cut it. I always use Martha Stewart’s pie crust recipe, and Deb’s is exactly same ingredient wise except Martha’s is made in the food processor. Funnily enough, so many people at the party said it was the best apple pie they had ever had and yet I did not like the pastry part of it myself. It seemed gummy and tough, though the apples were delicious. So I think I will try the apples again with my normal pastry method. And I will try Deb’s pastry method separately. Looks awesome and I have a ton of apples on my hands from an apple pie picking trip. What’s the best way to rewarm slices? In the oven or is microwave ok? I would re-warm ten minutes in a 325 oven to avoid soggy crust. My re-warmed five mini-pies in my toaster oven at this temp and they came out perfect. 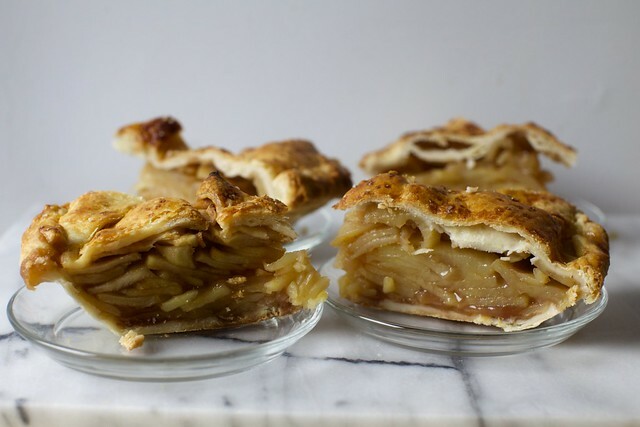 I LOVE your original apple pie recipe and have shared it numerous times…can’t wait to try this one. Hard to believe it could get better! I’m going to make the pie this weekend. Without the lemon juice, how do the apples not brown before baking? And how long can I macerate the apples (overnight would be great)? Not a food scientist at all, but I find that whether or not the apples got brown before baking doesn’t matter, that the brown disappears when they bake. But in this case, you’re mixing them right with the filling ingredients — no need for them to stand around browning. There’s also no reason you cannot add lemon juice if you wish. I haven’t macerated them overnight yet. I’m worried they could get too soft, but not sure. Wow the crust on this looks amazing. I prefer using brown sugar when I’m making these too. Is there a reason the tapioca starch goes in after macerating? It seems like it’d be easiest to add it in with the sugar, and would insure it’s well mixed, instead of mixing it in after the fact. I think adding it directly to the juices that have accumulates vs. to the apples before juices accumulates made it a bit more effective. Also, my pie center never got to 195 degrees; it was 160 or so by the time I needed to start cooling for transport. Even so, the apples in the middle were a good texture, and the apples at the edges had turned to applesauce. I think this means my oven was too hot, but it seems like 195 degrees isn’t important. Usually when the apples fall to sauce, it’s because of the type. What kind were you baking with? Granny smith. They were normal and crisp when I peeled them. Not sure. Were they from a grocery store? I mean, I buy mine there often when I can’t get them from a Greenmarket, so I’m not saying one shouldn’t, but they could be much older. Stella Parks says that apples fall apart above 200 degrees internal, if I remember correctly (don’t quote me on this, but it was around there). Is it possible that your pie got hotter sooner? I had a similar experience also using Granny Smith apples. The entire inside was basically apple sauce. Still delicious but not quite what I was giong for. I did get mine at the supermarket, so perhaps they were older and that played in to it. Made this two days ago and I will definitely make it again. Some notes in case anyone is interested. top crust: flaky but got a bit burnt (caught about 15 minutes in so I covered it in foil). I did an egg wash with sugar, so next time I may also skip the sugar. filling: excellent. I subbed 1 tbsp + 1 tsp corn starch for tapioca. I accidentally sliced the apples too thin (3 mm), but they kept intact! They were a mystery varietal. I only used 100 g of brown sugar and no white sugar, since I prefer a less-sweet pie. bottom crust: sadly uncooked. I think this one is my fault though because I took it out after 60 minutes since liquid bubbled out and started to burn. For what it’s worth the pie tin was aluminium and the sheet pan was dark metal. Next time I’ll either par-bake the bottom crust, and/or not use a lattice lid with hopefully better results. I’ll also try preheating the sheet pan in the oven as others suggested. I’ve made this twice in the last week which used just about 3 pecks of apples. The first pie I used arrowroot and all Stayman Winesap and it was pretty good. I added a little foil hat at the one hour mark to stave off overbrowning. Pastry was fantastic. I was a bit lazy and used the apple core/slice attachment from my mixer and it was probably a little too thin, but the apples held up pretty well. I made pie #2 last night with a few leftover Stayman and 95% Nittany. I was lazy again and used the slice blade on the foodprocessor (lol) but measured setting to make sure it was exactly a 1/4 inch. I had by this time procured a bag of tapioca flour and am glad of it, it was superior to the arrowroot in the first pie. Theres a ‘plump’ quality to tapioca, when i was spooning the juices over the pile of fruit in the shell the juice was ‘ribboning’ (mascerated fruit for over 4 hours both times), this made me less anxious about dumping so much juice in there. The second pie was amazing. Made it a little hat at the one hour mark once again. Put more sugar on the lattice this time. Holy crap. I’ve made every apple recipe on SK, this one is a on whole new level. I used to think I failed at pies and so at Christmas would usually make a fruit galette and a cake instead, but this year I’ll be bringing this pie, its nothing short of freaking epic. A million times thank you!!!!!!!! Brought this to book club tonight, everyone loved it! I will say, though, that for me, the spice level was a little too high. Maybe it was my cinnamon, or maybe it was that I had only about 4 lbs of apples in the house, but I found the cinnamon flavor a bit powdery and overpowering. When I tasted the filling after it had macerated, it also wasn’t as sweet as I like, and I missed the lemon flavor — so I fixed those things before baking, easy peasy. Next time I’ll cut the cinnamon down to maybe one and a quarter tsp. 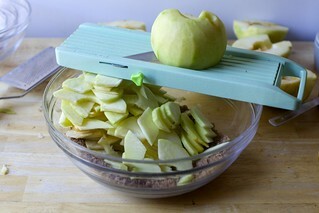 But I really love the effect of slicing the apples thin and letting them macerate for a long time. My apples weren’t piled high in the pie dish, they just filled it nicely, and the resulting pie was wonderfully solid with no top-crust gap. Our food processor has an adjustable slicing blade, so I used that to slice the apples to just under a quarter inch — so easy and fun! …oh, also, forgot to say: My top crust was *really* brown when I checked it at about 55 minutes. I covered it loosely with foil and it was still fine when I took it out about 15 minutes later. But next time I would probably cover with foil a little sooner. It looked gorgeous, with the sugar (I used Turbinado) sprinkled on top of the egg wash! The gap. My mom always gently steam the apples for her pies for just a few minutes, enough to get excess moisture out. She never had a gap, and her voice in my head always tells me to do this. However, I don’t recall her ever making one quite as tall…. In your experience, does working with apples out of the fridge have an effect in this recipe? I macerated for the minimum amount of time, 1 hour. Some of the interior apple slices in my pie remained a bit crunchy even after 90 minutes in the oven. My oven is calibrated correctly, and I have not had problems with cooking interior apple slices in less-apple-rich pies, so I’m trying to troubleshoot after the fact. I’m still very much enjoying the pie overall! Thank you! No, I don’t think cold apples make a huge difference. It could have been apple thickness, or they might have just needed longer to bake. Did you check the internal temperature? Yes, there were parts of it that got up to the required temperature (towards the bottom around the edges) but some middle parts that only got up to 165F or so before I took it out for good out of concern that the crust would overcook (I was also getting some dry apples on top through the openings in the lattice, even though I covered it with foil). I did reduce the sugar to 2/3rd cup so I wonder if not enough juices were drawn out of the apples to get them heated up). can we use white sugar? Deb, How do you keep the apples from turning brown if they are sitting out that long? They’re in with the sugars and spices — never noticed it. I tried this recipe and it came out delicious. The only issue I have is that the bottom crust was soggy. This has happened with other apple pie recipes so I know it’s not an issue with your recipe. Can give me any tips on how to keep the crust from getting soggy? Thank you! We sprinkle some extra tapioca directly on the bottom crust in all our pies. And of course waiting to cut until the pie is cold helps keep the bottom from getting soggy. Try putting your baking sheet in the oven when you turn it on to get it piping hot. When you place the pie on the sheet, it is immediately sealed from the heat. Followed the recipe, no problems with the crust or apples. Beautiful pie, but we thought the spices overpowered the apples. We have a heritage orchard and choose our favorite flavorful apples and were only slightly disappointed. I’ll definitely make again, but hold back on the nutmeg and ginger. Deb, I love your blog and your recipes, and I have, until now, trusted you completely. But this pie has just boiled over in my oven, probably because of its overabundance of apples, and caused a serious amount of smoke and marital discord. I have not yet eaten it, as it is still cooking, but I do want to warn everyone of potential problems. I made this and it took about 20 minutes more to bring it to the 195 degree internal temperature, but my oven is often finicky. I have never baked a pie to temperature before but I think I am hooked! It was perfectly bubbly and smells delicious! Thanks so much for another wonderful, tasty, successful recipe. I had just shy of 4 lbs of apples but kept the other proportions the same and it came out delicious. Cooking the pie on the bottom shelf of the oven ensured no soggy crust. Even the next day it was delicious. Ok I am on my third test pie for Thanksgiving. I always end up with juices that are too runny and a bottom crust that is under-baked. I followed your advice this time (thinner slices, tapioca starch, long maceration time, internal temp of 195, etc.) and for extra insurance, I reduced the juices and preheated a sheet pan on the bottom shelf. The crust is perfect but the juices are still runny. Am I missing something? Should I just add more starch? Thanks! P.S. Thanks for that foil-over-the-bowl trick! Is it completely and totally cool? Like from the fridge, even? It really should set if so. This look scrumptious, will adjust to Australian ingredients (re starch for filling) and give it a go. Delicious filling, delicious flaky pastry on top… but my oh my was the bottom completely soggy and soft. What a shame! I wanted to believe you could put the whole pie in as it is, but no, blind baking seems essential. I put the pie on a pre-heated baking sheet (metal pie dish, too) and didn’t use all of the liquid – but still, the bottom was inedible. I will definitely make it again, but par-bake the base first. Have you let it fully cool in the fridge? Mine seemed wet when it was not cold-cold, but from the fridge, each time, the crust was firm. Crisp, even. It can then be rewarmed if you prefer to eat pie warm. This was absolutely fantastic! It will be my go-to apple pie recipe forever more. Just wanted to add a couple of notes in case anyone is interested in slight variations. I prepped the apple slices and pie crust the night before and let the apples macerate overnight in the fridge. I added a splash of orange juice as suggested by another commenter, and it was a great addition, made the filling seem a bit wassail-y to me (a good thing). I ended up stopping at ~4 lbs of apples because my bowl was full and it still made a very full pie, which I baked in a 9″ cake pan because I couldn’t imagine it fitting into a pie tin and not spilling out all over. As it was, I was glad to have the tray and parchment underneath. As Deb suggested, I baked it on the lowest rack of my oven and the crust was perfectly browned and delicious top and bottom. I also used only brown sugar because I was too lazy to get out the white, and used 2 T cornstarch because I was out of tapioca starch. Finally, I assembled the pie in the morning and then baked just before dinner. Turned out fabulous! Perfect apple pie. Without question. I used flour as I could not find tapioca starch. I have instant tapioca but wasn’t sure if it’s cook into a smooth texture. May try it that way for myself but this pie was to serve people at work. High raves, one saying it was the best apple pie he’d ever had. Thanks for another great recipe, Deb! I’ve made apple pie before, but I must admit I am not the best at baking, and tend to burn things very easily! However as an expat living overseas, I’d love to try this one as part of Thanksgiving for some friends, thanks for the detailed steps and photos- really helpful for a baking novice. May serve with vanilla ice cream…if it’s not *too* indulgent! This reminds me of the apple pies my Nana used to make me in my childhood! This weekend’s farmers market can’t come fast enough. I now need at least 4.5 pounds of apples because this pie looks divine! 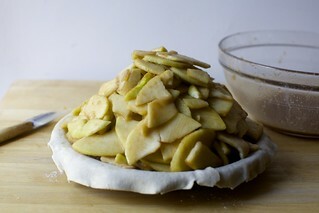 Having bought too many apples pies, each sickening sweet, I’m trying my hand at making one from scratch. I LOVE your s’mores pie recipe so will try making this apple pie recipe for Thanksgiving. I like the simplicity of the recipe and that there isn’t too much sugar. Hoping mine turns out as good looking (and tasting) as yours. This pie looks SO delicious! I HAD to share it on Facebook so others can try it! I’ve NEVER thought of using more than one type of apple in a pie before. That’s such a great idea to give it a different flavor with each bite. I am so excited to try it for Thanksgiving! Thanks so much! OMG I love apple pie! I’ve never made one myself, but seeing how you piled those apples as high as they would go makes me want to try this recipe! Cheers to delicious fall desserts! I made this on Sunday! My family and I went apple picking a few weeks ago, but then I was too sick to bake. This weekend I finally felt well enough. I never made homemade pie crust before, as I always bought the frozen pillsbury stuff, but I wanted to give it a try. I rolled the top crust a bit too thin, but it tastes amazing. I let the apples macerate for over two hours and the apples still shrunk and the top crust collapsed a bit when it cooled, but everything tasted great. I think I might leave out the ginger and cut back a bit on the cinnamon as they were all I could taste. We still have some in the fridge and have been taking slices of it all week. Definitely a keeper. Thanks! Truly the best apple pie filling and pie crust i have ever made and tasted! Making it for Thanksgiving. I have a large ceramic pie plate (11.5” x 2”) can you help me scale this up? The apples and spices I think I can figure out but I’m worried I won’t have enough crust. I just made this for a get together with some friends. Due to moving [and not having all the ingredients] I did have to make a couple of changes. I used the ‘all butter, really flaky pie dough’ recipe from SK [always my go to], though I use a food processor for convenience [sorry Deb]. I also use an egg yolk as a wash for the top crush [makes it super shiny and perfectly brown], and the egg white as a moisture barrier for the bottom crust [spread before adding the apples, and it will help to prevent a soggy bottom crust]. I think people whose crust has been burning/overcooked may have been rolling the crust too thin: it should just barely overlap the edges of the pie dish when put in. I had no troubles with 75 min at 400 degrees, lattice top and all. The crust was perfectly done and the apples had just enough structure left to not fall to mush, but be a nice, hearty bite. As it cools the apples will shrink some – but not nearly as much as other apple pies – and once you cut into it and serve slices the top comes back down anyone, so nobody noticed. I did swap out all of the white sugar for more brown sugar. Didn’t have ginger or cloves [b/c of move -sigh-], but I do like to put in about a teaspoon of vanilla extract, and a tiny bit of thyme. The thyme gives it the lemony-ness of citrus, a little wake-up, but without the risk of overpowering the other flavors. 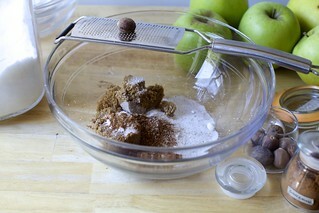 The nice thing about slicing the apples thin is that the sugar and spices have more surface area to coat. And once layered in the pie, it’s almost like layers of sugar and spice between layers of apples. All and all, a really nice recipe/technique for apple pie. I should also add, that I wasn’t able to use the tapioca starch/flour. I never make pie often enough to justify buying it. The solution that I’ve found is to use regular old flour, but, before adding the flour, toast it until brown. That brings out a nuttier flavor, so you don’t get that unbaked flour taste. If you do this, you will need to toast more than 3 tablespoons, as it will have the tendency to clump up and you’ll need to use a sieve to prevent the clumps from getting in the pie. I followed this recipe yesterday to make my first ever pie, practicing for thanksgiving. the pastry is delicious and the top pastry was perfect, but the filling had way too much liquid and the inside was soupy so the bottom crust was soggy. what did I do wrong?I may try again with less apples, and not use all the liquid, and 4T tapioca. the flavors were amazing so I’m determined to perfect it. my 12 year old even suggested I should still make it for thanksgiving and feign surprise when we cut it – she said it tasted so good it didn’t matter….but of course it does! Let the pies cool completely, even in the fridge overnight. Let the apple’s natural pectin do its thing! It might not be so sloshy in the end. What kind of perforated pie pan do you use? I saw that the one in your photo had holes and assume this was to cut down on any sogginess. (I asked this question some days ago, and know you are really busy, but would be really grateful to know. A one-worder will do!) Many thanks. Well, Deb, I owe you a huge thank you. This is a fantastic apple pie recipe. My husband said it was the best ever and his mother could really bake delicious pies! I’m a reluctant baker who now feels empowered to try again and again. I’m in central CA and used Opals and Lady Alice apples on the advice of the Vons produce manager who is a genius. Happy Thanksgiving! Can I use a crumble topping here instead of the lattice top? Yes, my question too! My husband specifically requested crumble topping but this pie looks amazing. Any help? Thank you!! I have a variation of this in the freezer ready to bake on Wednesday. Only change I made was to cook the macerated juices into a syrup before adding them back in. I used a mix of granny smith and fuji apples. Will report back once baked up and tasted! Can you make this in advance and freeze it? I wanted to make it for Thanksgiving and freeze it now, bake on the day. I can’t want to make it! I normally macerate but I am going to up my apple amount and I already went to the farmers market and bought mutsu apples. Thank you for this recipe. Amazing pie for a Friendsgiving centerpiece dessert! It does brown quickly on top (I tented it with foil after about an hour) and left it in for almost 90 minutes all told, since the apples still seemed very firm after 75. After cooling, the fruit compressed leaving a lattice “birdcage,” but it still looked beautiful. A challenge to cut with all the fruit (I didn’t have time to let set fully in the fridge), but the crust and filling were gorgeous. I used Granny Smiths and it was tart and not overly sweet, which is how I like pie. A huge hit and perfect pairing alongside pumpkin cheesecake! Made this for an early Thanksgiving. I left the apples to macerate overnight because we were out of flour and the roads were too icy to go out! My pie wasn’t quite so tall but it was delicious. I added another tablespoon of tapioca flour since I had some extra juice. The bottom of my pie was not as done as the top but no one minded. This was my first time making an apple pie and I will definitely be using this recipe again! Did you hear us talking about you at my knitting group today? We were talking pie and I was telling everyone how excited I was to be trying your new and improved apple pie recipe for Thanksgiving. A long discussion ensued about the wonders of both pie and the amazing Deb Perelman. Just so you know you have a fan club right here in Portland Oregon! I’ve still a large stock of apples from a rich harvest this season and can’t wait to try your amazing perfect apple pie. Can you slice the apples the night before and leave in the fridge? The pie was a huge success! I macerated the apples the day before and left in the refrigerator overnight. I used Cup for Cup gluten free pie crust which was delicious, you couldn’t tell it was gluten free. Cooked the pie for around 95 minutes to reach 195 degrees. There was a gap between the top crust and the apples but everyone loved it. Will definitely make again. Thanks for the recipe!! Emergency Tgiving prep – can i make the apples now and let them macerate overnight and assemble the pie tomorrow morning? Made this last night and it turned out beautifully! Not as tall as Deb’s, but definitely not sunken. I used my favorite tried-and-true life-changing food processor crust recipe from Serious Eats. After reading many comments saying that there was a large gap between the top crust and the apples, I made sure to really pack the apples in and gently push them together so there were no hidden pockets – I think if you just dump them in without packing them you will have the gapping problem. Also, I couldn’t fit all my juices in without overflow and I probably added a bit more than I should have dared because holy smokes – literally! – I had a lot of caramelly juice bubble over onto the baking sheet and had to get the fans going for the last 30-40 minutes of baking. Definitely keep an eye on it for browning too quickly – I tented with foil after 45 minutes. I hope it tastes as good as it looks – will report back after we dig in tomorrow! Happy Thanksgiving to all celebrating! Finally reporting back! The pie was a huge hit. I was worried during assembly that the spices would be overpowering since I was getting really strong whiffs of the cloves when stirring the filling but the flavors melded beautifully after baking and sitting for a day and everyone loved it. The texture of the thin slices was wonderful too. I did end up with a bit of a soggy bottom and would probably try blind-baking next time, although no one complained. Even after I brought it up, no one else was really bothered by it. We let it fully cool (for well over 24 hours in fact, as I had to make it in advance due to work and travel schedules) so I don’t think that was the issue here. As I said, I didn’t use the pie crust recipe that Deb recommended, however I’ve never had a soggy bottom using it before and I never blind bake – but I’ve also never made an apple pie with it before. Would totally make again, but would probably try blind baking first and definitely, definitely, definitely take Deb’s advice to cover your baking sheet with aluminum foil! I just wanted to say thank you! I have made this three times now. So good! My second attempt at this pie! Is there any reason why juices would be bubbling from the pie and the apples feel fully cooked based on poking in the thermometer, but the interior temperature would read a mere 180? Side note: I took another commenter’s advice to microwave the apples for 7 minutes before cooking, and got a lot more juice released with the amount of sugar I like to use (2/3rds cup, so slightly reduced from the recipe). My first attempt sat grudgingly at 165 degrees even after over 90 minutes of cooking, very possibly because I messed with your precisely calibrated sugar levels, so I am very pleased with this adaptation! Maybe I’m just overthinking the temperature thing? I would have very happily taken out the pie at this point before I learned about this exciting and novel notion of taking its temperature. It could be the thermometer. However, I found that to get the pie to the right temperature, I baked the pie longer than usual (at least with my first of three test pies) and it wasn’t mush inside, instead, a nice caramel flavor. Hope yours is a hit! Happy Thanksgiving! Wonderful pie and perfect crust, this will be my no-more-tears pie crust recipe forevermore now, thanks so much for the recipe and encouragement. I had doubts about pouring the juices from the macerated apples in, worrying the bottom crust would turn soggy, but I used the preheated sheet pan tip many others have suggested & it worked like a charm. (long time reader, first time commenter) I made this for Thanksgiving and it came out amazing!! People loved the layers of apples and that they weren’t mushy. I used pink lady, honeycrisp, fuji, and granny smith apples. I followed the recipe exactly except I sliced the apples by hand since I don’t have a mandolin, and I used 2 tbsp cornstarch, 1 tbsp flour instead of tapioca flour since I totally blanked on buying it. The all-butter flaky pie dough made an awesome crust too! I made a “fattice” lattice via the link you posted in the “assemble” section. Thank you so much for this recipe (It’s what I’m doing from here on out! ), the tips, and the additional links. This was exceptional! I did make it in a deep-dish plate, because my family prefers crumb tops and that won’t work with an Everest pie. Covered the filling with a foil lid for 40 minutes, then added the streusel for 40 minutes. Otherwise followed the directions exactly. Yum! Made it this year! It was my first apple pie, my first double crust. (Crust and I have a stressful relationship) and I nervously served it to a crowd that has high apple pie standards. IT WAS A HIT – one said it was better than his mothers! THANK YOU for all that you do! Awesome pie! This will be our new go to recipe from now on. We didn’t use the full amount of apples and it was fine but it would be fun to try mounding them high next time. Thanks for another great recipe! Oh I made this pie for Thanksgiving as I wanted a slam dunk of a pie and was sold when I saw all the spices in the recipe and that it didn’t have a ton of sugar in it. I have to cook gluten free so I used my favorite crust and then macerated the apples ( I used 4 different kinds) along with 3 T of boiled apple cider and the spices. Then followed the rest of the recipe exactly and it was like a DREAM! Thank you so much, best taste/texture. Thanks for delivering on your promise of a perfect pie. BEST.PIE.EVER.BEST.CRUST.EVER. No other words. So amazing, the most compliments I’ve ever gotten! Thanks for the recipe. I made it for Thanksgiving, and everyone loved it. The only change I made is the use of tapioca granules (ground in my spice grinder) as a substitute for tapioca flour. I used Paula Haney’s recipe for an all-butter crust–https://www.epicurious.com/recipes/food/views/hoosier-mama-all-butter-pie-dough and Stella Parks’ technique for a herringbone lattice top–https://www.seriouseats.com/2016/07/how-to-make-fancy-herringbone-lattice-pie-crust.html. You have to adjust Paula’s recipe by 1.5 times to create extra dough, as you need more dough (about 14-15 ounces instead of the 11 ounces recommended by Stella) for the lattice strips. The end result looks spectacular, and with your wonderful filling, it tastes great. Also, in reading some of the comments, I have some insights. For those of you that don’t want to use tapioca, sugar free pectin is a good thickener. I tend to avoid cornstarch in pies, but arrowroot could also be used. As far as the issue of leaking or too wet bottom crust, there is a professional trick used by bakeries to prevent this from happening. Create “pie dust”, a mixture of sugar and flour in a 1:1 ratio to spread on the interior of the bottom crust prior to placing the filling. This works great. 2. a thin layer of melted chocolate. These I reserve for creating a specific taste profile in the pie. I’ve done this version of apple pie twice now and each time the tapioca flour failed to thicken properly. Both times half the juice ran out when the first piece was cut. The first time I thought maybe I’d taken the pie out too soon and the tapioca didn’t have a chance to set but the second time I let it bake longer and still the filling was runny. It tasted fine but was a mess. For Thanksgiving I think I’ll go back to my flour & cornstarch combo. My favorite pie apple is Braeburn. I do use tapioca as a sprinkle in on the bottom crust to help keep it from getting soggy. I put my pie on the oven floor for the first 10–15 min of baking and then move it up to mid oven onto a hot cast iron griddle that is 1″ diameter larger than the pie plate to catch drips. My bottom crust is never soggy. Made today to take to a New Year’s Day dinner. Turned out really well. No gap in crust after it cooled. The crust was delicious, albeit a little tough which could be my fault (used a food processor instead of pastry blender). Used 2 tbsp flour because I didn’t have tapioca, and left some of the juices (from macerating ~2 hrs) out of the pie. The flavor of the filling is just perfect. Cooked an extra 5 minutes – apples in the center never got above 170 (lattice crust) but apples on the outside were a bit above 195, though the texture throughout was perfect for me as is. Thank you! I made this pie before, and it didn’t turn out that great. So, same recipe, changed methods, I actually placed the pie pan (deep dish soapstone) in the oven for 25 minutes to preheat. I placed the bottom crust in the pan, the butter was actually sizzling on contact, I was sure it would be pie fail. Nope, it was perfect, and even the pie filling juices thickened up considerably. The bottom crust was flaky, tender, and definitely didn’t have an “uncooked” taste. Granted, placing pie crust in a pan that is 400 degrees is a bit challenging. Throw it in, push it down, be careful. Add filling and top. It was fine. Does all purpose flour work? Or do I need more than 3T if using AP flour? Do you have cornstarch, perhaps? It would work better. I made this for Thanksgiving, and it was delicious! However, I made a few changes– most by accident/poor planning. And it still turned out to be the best apple pie I’ve ever made. 1. I let the apples mascerate for 1.5 days. I chopped them and stirred them with spices and sugar Friday afternoon, fully intending to finish the pie that night, and then I ran out of time. And then I overslept on Saturday and didn’t have time again until Sunday morning. It was still glorious. 3. I used a mix of pink lady and granny smith– the only apples you can get easily here in Uganda (where I live). They held up perfectly, despite hanging out in the fridge for 40-ish hours after being chopped. Not too mushy, not too crunchy. 4. I didn’t realize until I was (finally) getting the pies ready to bake that I did not have any thickener in the house. (I had planned on using corn starch, because that’s what I can get here.) So I took advice from another commenter, drained the sugary juice from the apples and boiled it down to a syrup. I poured most of my back over the apples before I added the lattice. The rest I reserved to brush on the top crust periodically while baking. It was beautiful and glorious and not the least bit runny. Now that I know I can do this, I doubt I will ever use thickener again. I didn’t even have much time to chill it in the fridge before heading out to our Thanksgiving dinner. What you should take away: This recipe is pretty forgiving, much more so than you would think, and very impressive. I doubt I’ll ever make an apple pie any other way. Thanks for another great recipe! I love happy accidents! I bet your filling didn’t sink in the baking leaving that gap that you can sometimes get with fresh apples. My mom used to steam her apples slightly before adding to her crust. This removed the excess moisture, which is what you did when you let them sit for all that time. I will try the boiled syrup method next time!